Faisalabad: April 17, 2018: CCI Pakistan, Coca-Cola’s bottler in Pakistan inaugurated its Greenfield bottling plant in Faisalabad today. 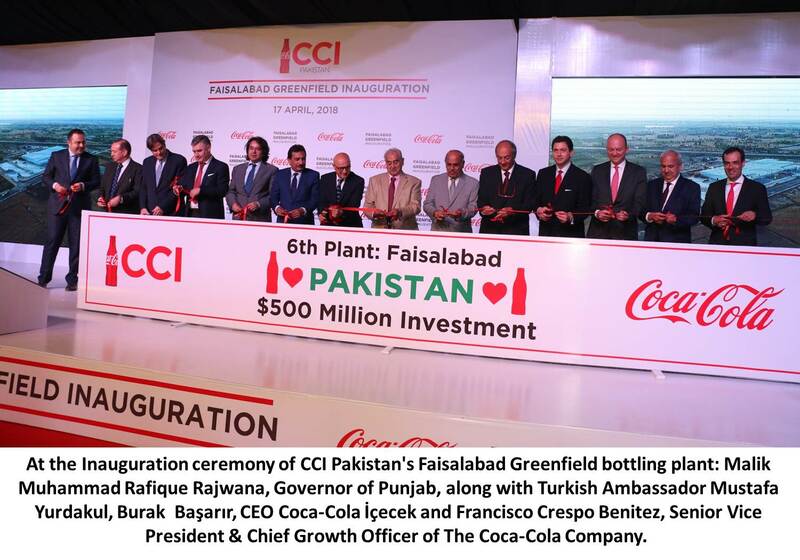 CCI Pakistan is a subsidiary of Coca-Cola İçecek (CCI), headquartered in Turkey, the sixth-largest bottler in the Coca-Cola system globally. Set up with an investment of US$ 45 million, the facility is CCI Pakistan’s 6th plant in the country and CCI’s 26th in the region. The new plant in Faisalabad comprises of CCI’s fastest and highest capacity PET lines and will add 450 million liters to the company’s volume annually. CCI has invested more than US$ 500 million in its business in Pakistan since 2008. CCI Pakistan has a total of 25 production lines, 530+ distributors and more 330,000 sales points and is catering to a consumer base of 208 million people. In the last 10 years CCI Pakistan has almost doubled its market share. Also present at the occasion were: His Excellency Mr. Malik Muhammad Rafique Rajwana Governor, Punjab, His Excellency Mr.Mustafa Yurdakul, Turkish Ambassador, Her Excellency Ms. Aisha Pasha, Finance Minister Punjab, Mr. Burak Başarır, CEO Coca-Cola İçecek, Mr. Brian Smith, President of The Coca-Cola Company’s Europe, Middle East and Africa Group, Mr. Zoran Vucinic, President Middle East & North and Mr. Rizwan Ullah Khan GM The Coca-Cola Export Corporation Pakistan and Afghanistan. CCI Pakistan produces, distributes and sells sparkling and still beverages of The Coca-Cola company in Pakistan. Having first started in 1996, Coca-Cola bottling operations in Pakistan came under the roof of Coca-Cola İçecek in 2008. CCI Pakistan serves a consumer base of 208 million with 6 plants and close to 3000 employees across Pakistan. Its product portfolio comprises Coca-Cola, Coca-Cola Zero, Sprite, Sprite Zero, Fanta, Cappy, Rani, Monster, Mutant & Dasani.